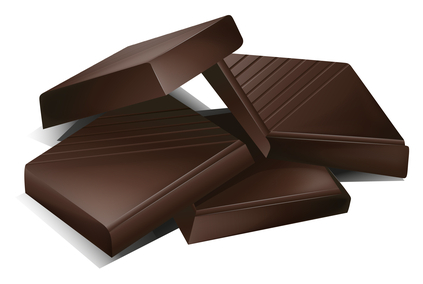 The Examine.com editors have finished the page on bioactive compounds in chocolate. Collectively, these molecules are called cocoa extract. Not all of these molecules are unique to chocolate. The compound epicatechin, for example, is also found in prunes. Procyanidin B2 is found in grape seed extract and Pycnogenol. Most of the interest in cocoa extract is due to its high (-)-epicatechin content. Low doses of (-)-epicatechin are associated with benefits related to blood flow, due to improved nitric oxide (NO) synthesis. Unlike most pre-workout supplements, which provide L-arginine in an effort to unreliably increase nitric oxide, (-)-epicatechin works at the rate-limiting step of NO production by stimulating the enzyme that produces it. This results in improved blood flow to the brain and reduced blood pressure. This effect may be able to reduce the rate of cognitive decline in older adults. One study even found healthy people supplementing (-)-epicatechin experienced a protective effect in the kidneys due to improved oxygenation. Improving nitric oxide synthesis also improves insulin signaling. This is why low doses of (-)-epicatechin improve insulin sensitivity, particularly in muscle tissue. Evidence from animal studies suggests this may improve physical performance and facilitate effective energy use in muscles. Eating dark chocolate (50 – 85% cocoa), baker’s chocolate, and semisweet chocolate provides a low dose of (-)-epicatechin and results in the same effects as cocoa extract supplementation. About 25-40 grams of chocolate is equivalent to the standard (-)-epicatechin dose. This is about 200 calories of chocolate. The more cocoa chocolate contains, by weight, the less is needed to achieve the same (-)-epicatechin dose. White and milk chocolate do not contain enough catechins to provide the health benefits associated with dark chocolate.